And now for my project! I had a pirate minion!! From SVG Cutting Files I used one of the Ornate card bases. From Jaded Blossom I used Pirate Booty stamp set for the sentiment. SORRY HOP HAS NOW ENDED!!!! oh I just love the pirate! 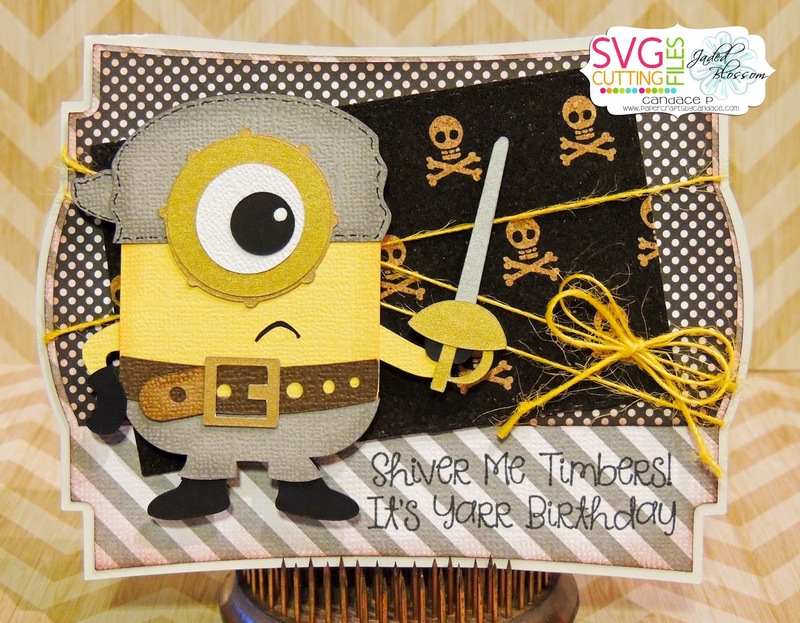 So cute...love the pirate minion. Thanks for the hop! Everything was amazing. Awesome card candace! Love these little guys! Super cute card -- wonderful end to such a fun and creative hop!! Garrrrrrr!!! What a wonderful HOP ladies, as usual!!! Thanks for sharing all your creativeness!!! you make me want to quit met job and lock myself in the craft room…..LOL! Great work by everyone. Thank you. Shiver me timbers, indeed! He is great! He too cute to be a pirate! Oh wow! This pirate minion is adorable. He can come steal my stash of banana booty anytime. Think this is my favourite ! Love the pirate! So very cute!!!! Awesome project!!!! Thank you so much for sharing. Hope you have a great crafty day!! Awesome for my sons' camp theme this weekend, Thanks!! Adorable card! Thanks once again for sharing your awesome talent! How can you not love a pirate minion?! Love Pirates! The best for last?! Arrrgh! Me thinks I will be using him quite a bit - I can see treasure in my future! Thank you so much for this design! Cutest pirate ever. Love this! Great job mate! thanks for sharing. Pirates are awesome! Great job! Great job. Love that pirate minion. A pirate minion oh ya. Cute Card! Too cute. You've done a great job. I love the paper you used! These were all great!! Thank you guys very much!! Super AWESOME hop as always!!!!! He is great. Gotta love a pirate. Oh, I LOVE this one. Every project has been fantastic. Thank you. Could almost be Johnny Depp!! Love it to pieces!!! All so cute! Thanks for sharing!! Great ending to the blog hop. What a fantastic card. Your pirate minion is so adorable! Love the pirate minion! Fantastic! Cute pirate minion. I love the pirate paper choices. great hop! One of the best ones ever! This hop was amazing and to finish it up with a pirate card. Love it! What a fun way to finish a great hop. I love your pirate minion card! What a fun hop! Absolutely adorable! I love pirates and this guy is adorable. So creative! Too Cute! Love the Minions! Love it! All these files are so cute! Shiver me timbers, this one is me favorite! Thanks me hardy! This little pirate is too cute!! i love this card, its super cute. Minions + Pirates = Awesome. A perfect ending to an awesome hop!! THANK YOU!! All the inions are so adorable. thank you. HAHA! Your card is so cute! I adore this price minion project! What a cute pirate minion! This hop has been so darn cute. I think I chuckled at each stop! Thanks to everyone for doing this wonderful blog. I love this one. This has been such a fun hop thank you for all the fun projects! Love it. Super cute. TFS. Always need more pirate themed stuff! Thank you. Argh...this be a mighty fine birthday card. too cute! love all the projects! Thank you all for another amazing hop!!!! so funny pirate minion. Great job! OMG Pirate Minion!!! Love love love!! This was a great hop. Thanks so much for sharing all your talents with this. Love the pirate Minion!! Soon cute!!!! Love It! Thank you everyone for the wonderful hop! Oh my word, this is so cute! So cute! Great Job! My favorite one! Looove the pirate!! Great card! Aaaarrrgh! Love me yer pirate!!! Love your pirate! I love how your awesome inking just added the perfect finished touch. Thanks! So darling, if pirates can be darling. Love the Pirate Minion. Thank you SO much. Awesome HOP!! !